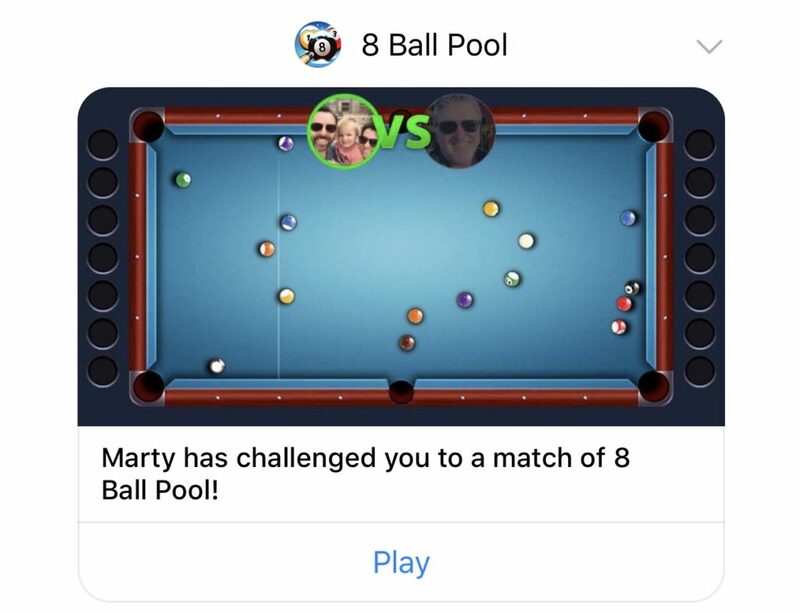 A few weeks ago, I received a message on Facebook Messenger from my father in law to play a game of “8 Ball Pool”. I wasn’t expecting a game request to come on my phone’s Facebook Messenger app. I thought it might be spam. So I texted him, outside of FB Messenger, and asked if he invited me to play a game. He said that yes he did, so I played him and I quickly became addicted. We played a bunch of games together, and by the way I initially won a majority of the games, it was clear I initially knew something he didn’t. Back when I was in college, I loved playing pool so much that I got a job at the school’s recreation center, which had 16 pool tables. My favorite days to work were Saturday mornings because the place was mostly empty, so we’d play pool on one of the tables close to the register. Though we weren’t supposed to play on the clock, we did. We played all the time on the clock. Even when I wasn’t working, I was playing. If I wasn’t studying for an exam, I was playing pool. Actually, often times I would play pool in lieu of studying for an exam (but still somehow graduated with honors). I had a couple buddies with which I would often put in eight hour sessions; We’d play all day long. We got pretty good. Often times, some old sharks would come in and play us. Some just wanted to try and a few bucks off of the “rich” college kids (I went to a state school because tuition was cheap). Others just wanted to play. Though I was the typical arrogant young kid who knows it all, I did learn a lot from these guys. I learned that while you do need physical skill to actually make shots, much more of the game was strategy. Before I figured out what these guys were doing (and started listening to their sly teachings), I lost a lot of games I shouldn’t have lost. When I started playing my wife’s father on my phone, it all came flooding back. My life has had many journeys that have taken me away from the game, and I’ve only played a few times since college. But even just playing a video game on my phone, I still get a good adrenaline rush from running the table (winning the game in a single turn). The Facebook Messenger version of “8 Ball Pool” lets you take a turn, then it passes it back to the other person. There is no time limit on an individual shot or in between turns. Thus, it only took one time that my father in law didn’t play me back for a day where I needed to get my fix. 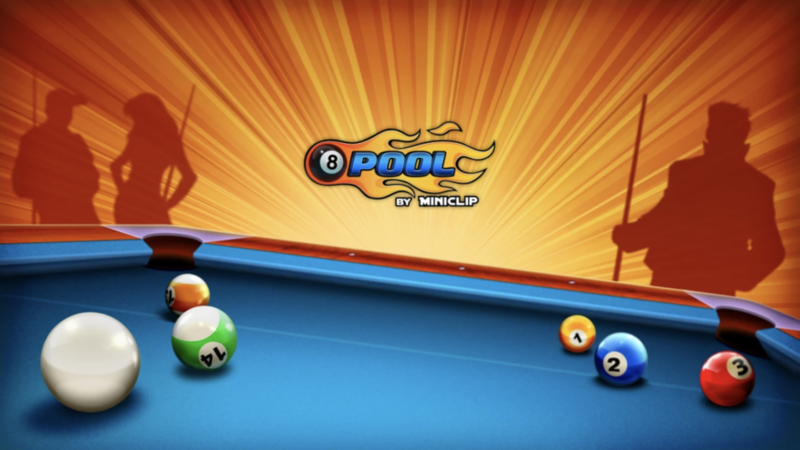 So I looked up the pool games in the Apple Store and I readily found the full app version of the “8 Ball Pool” game by Miniclip. I started playing 8 Ball Pool by Miniclip and was initially taken aback by the time limit on each shot. I hated it at first, but realized it keeps the game moving and makes me a better player. So I quickly learned to appreciate it. 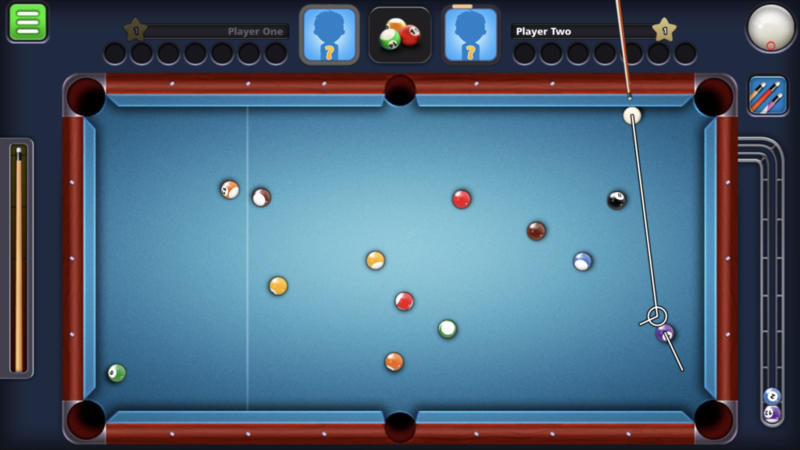 In the 8 Ball Pool video game app, when putting English on your shot, the spin on the cue ball doesn’t affect the cue ball’s path before it hits the object ball. Thus, in the video game, I can hit a shot from one rail to the other with put pure left spin on the ball and not have to account for the spin in the aim of the shot. 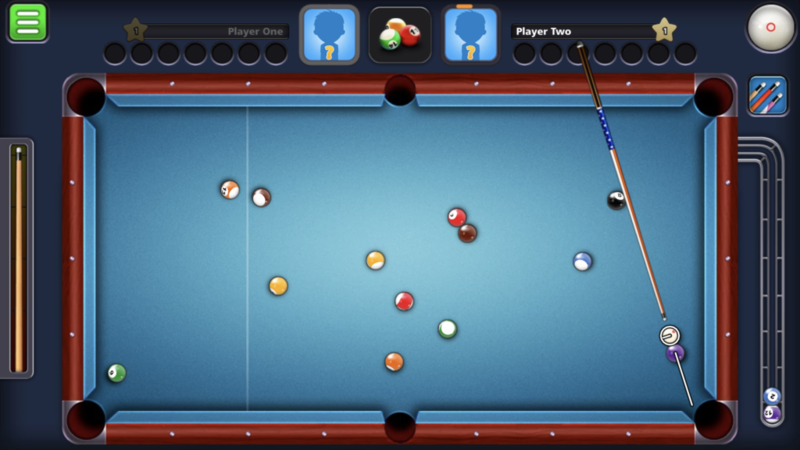 In real life, on a real pool table, the cue ball is going to curve before it hits the object ball, so you have to aim a bit further right to account for the curve to the left on a long shot. 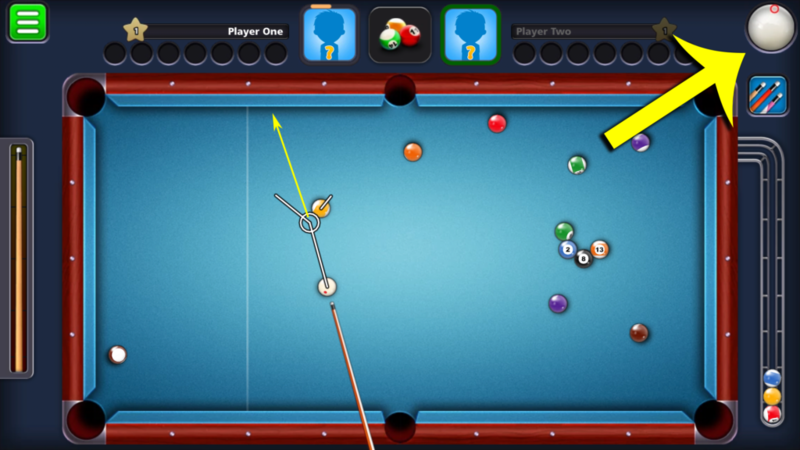 Below, a shot is lined up on the 8 ball in the 8 Ball Pool Miniclip game. This shot needs to be hit fairly hard to get the 8 ball to the pocket, because the cue ball is “cutting” the 8 ball, which won’t transfer much momentum on contact. The cue ball will keep most of its momentum. Therefore the cue ball is going to hit the rail after the 8 ball and come off that rail with a fair amount of speed; enough to bring it to the side pocket or the corner pocket on the top and top left of the screen shot. Therefore, this shot needs to be adjusted to add some English, where the cue stick will strike the cue ball on the right side, such that the stroke will put right spin the cue ball. That right English will cause the right spin on the ball to “grab” the rail and therefore reduce the angle with which the cue ball comes off the rail after cutting the 8 ball. The cue all will head towards the middle of the table instead of up towards the top pockets. Regardless of all that information, the point is that whatever spin is put on the cue ball in the shot below, the aim of the shot does not need to be changed. The path from the cue ball to the 8 ball stays the same straight line. On a real pool table, in real life, the cue ball would curve to the right (with right English) on its way to the 8 ball, hitting the 8 ball in a different location than it would hit on the straight line. As such, the aim would need to be adjusted left to compensate for the amount of curve to the right. 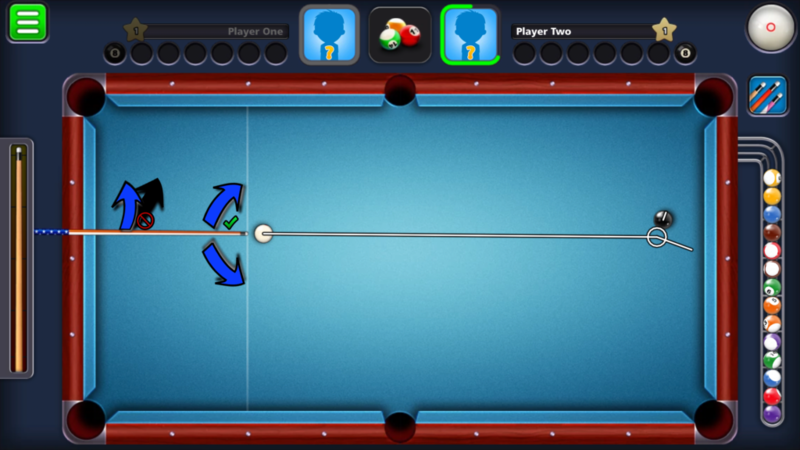 In the 8 Ball Pool app, when the cue ball is sitting up against the rail, you can still put backspin (bottom spin or draw) on the ball. In reality that’s not possible because the rail is in the way of hitting the bottom of the ball. 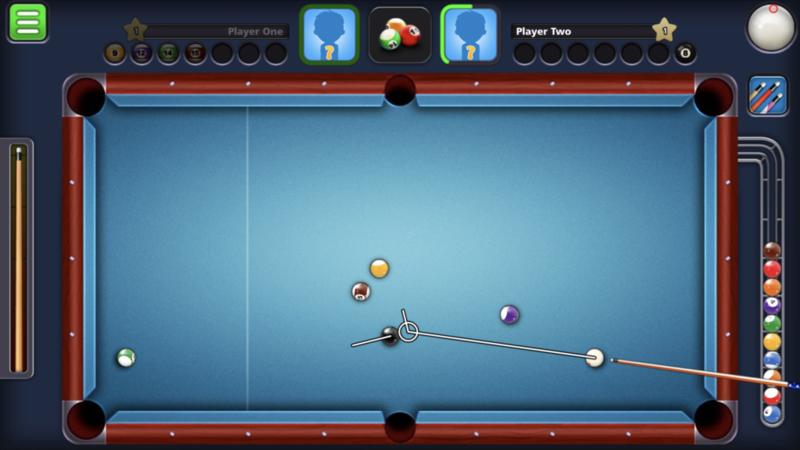 In the screen shot below, the cue ball is against the rail, yet the player is still able to put spin on the bottom of the cue ball to get draw. That’s not realistic, as the rail is at the center of the cue ball, leaving only the top half of the cue ball accessible to hit. The bottom half of the cue ball is below the rail and cannot be struck by the cue tip. Note: Draw is not really needed in the shot above, the screen was just taken as a rudimentary visual example to illustrate the point. In the 8 Ball Pool app, when the cue ball is directly touching another ball, and you hit that other ball head on, the shot happens just fine. On a real pool table, this is a very tricky shot. If you hit the cue ball in the center you will push the cue ball which is illegal. If you hit the bottom of the ball, you’ll likely draw the cue ball back onto your stick, or end up getting under the cue and popping it off the table as part of a shaft foul. Since the cue ball is already touching the object ball, the draw is instant and there is virtually no time for the cue tip to get out of the way as the cue ball comes back from the draw. You really need to hit the very top of the ball, but even that may still be a push. In real life, you’d probably hit the cue ball perpendicular to the object ball’s path to the pocket. In the picture below, the cue ball is touching the object ball and the position to hit the cue ball with the cue stick tip is in the center. This shot will work just fine in the game but in real life its a “push” foul. I haven’t been on a table in a while, but in the 8 Ball Poll app, you can hit shots very hard and not have unfavorable results. I can hit with full force along the width of the table and the ball will bounce back and forth five to six times. I don’t think I could do that on a real table. If I hit it that hard in real life, it would likely fly off the table upon hitting the first rail, especially with top spin. 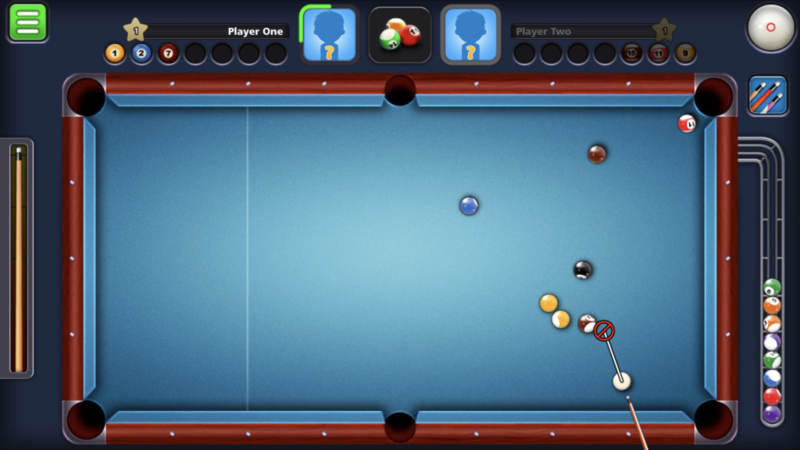 In the shot below, the cue ball was hit with full power, using a cue that had a power rating of 5/10 bars, and the cue was able to cross the table six times. I don’t think I could get it to do that in real life; but again, its been a while since I’ve played on a physical table, so maybe I could. I also know that in real life, the harder you hit the ball, the less accurate your stroke becomes. In the game there is no change to your accuracy with the strength of the shot. 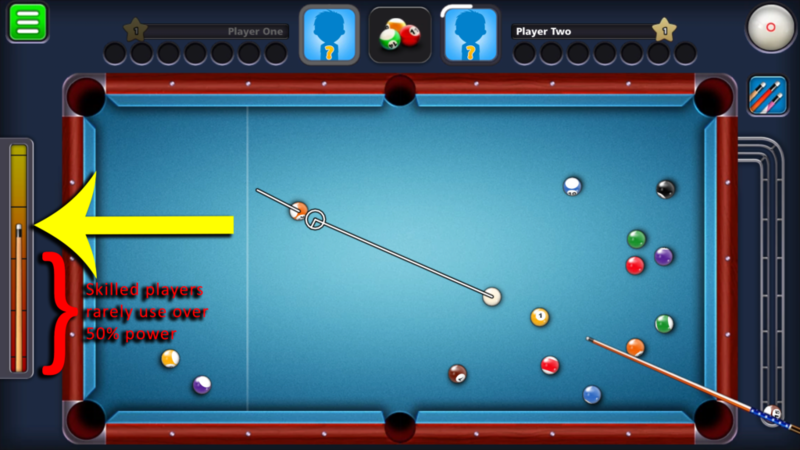 In the 8 Ball Pool game, there is no vertical angle on the cue stick. You can only move the stick left or right to aim a shot. You can’t lift the back of the cue handle up higher than the tip of the cue. Thus, you can’t curve one ball around another within a short distance. You also can’t jump one ball over another, which is possible to do (though hard to do legally) on a real table. Regardless of the differences between the 8 Ball Poll app game and a game on a real pool table, I absolutely love the app. My biggest reason for loving it is that you can really work on your strategy. Because the games are so fast in the app and the physical limitations (getting tired, not physically accomplishing a properly lined up shot due to a bad stroke) are removed, the amount of strategic experience you can get in short amount of time is unparalleled. I wish I had had this game available when I was in college (15 years ago). If I was playing with a few people and was off to the side waiting for my next turn to get back into a game, I’d be playing this app! I am still an amateur when it comes to strategy, but here are the pearls I’d bestow on anyone, especially a beginner willing to listen. The most basic advice that beginners don’t fully understand is to always be thinking about the next shot(s). After you make the current shot, the cue ball ends up somewhere on the table. You need to learn to control where the cue ball ends up. The goal is to be able to decide where can you “leave” the cue ball after the current shot such that the next shot is set up for an easy shot. When you think ahead, you can leave yourself with easier shots than if you just slam the balls into the pockets and try to figure out what to do when the cue ball finally comes to a rest, wherever that may be. Even better is to gain the skill of looking multiple shots ahead and being able to leave the cue ball in a position that not only makes the next shot easier, but puts the cue in a position to make the next leave easier, thus making the next two shots easier. In the time allotted in the 8 Ball Pool app, I’m pretty good at looking about 3-4 shots ahead. I try to plan my next 3-4 shots before hitting the current shot. The best players, have the experience and skill to look at a table and quickly map out their full run (7 shots) to the 8 ball. Below is an example of thinking multiple shots ahead to find a complete path to the 8 ball. 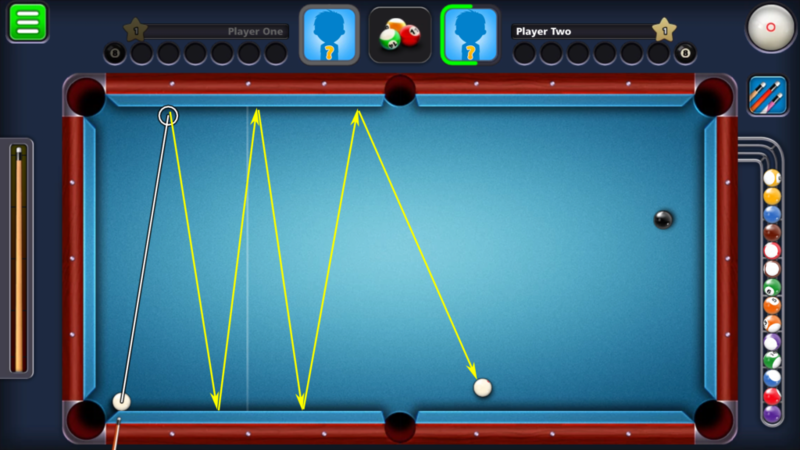 The yellow arrows are the cue ball movement before it hits the object ball for the current shot. The orange arrows are the cue ball movements after hitting the object ball before coming to rest for the next shot (the “leave”). The white arrows are the path to the pocket the object ball will take. In playing real time in the 8 Ball Pool app with its shot timers, you may not have time to think this far ahead. But the more you work on thinking multiple shots ahead, the better you will get at it. In executing the shots above, I may screw up the leave on one of shots and be forced to recalculate my path to the 8 ball. Again, the more I calculate ahead, the faster I get at doing it real time in order to make adjustments when necessary. This is where the app is great for gaining strategic experience. Having good touch is paramount to playing a good strategic game. Much of the game of pool is about cue ball control. You have to be able to put the cue ball just about anywhere you want as a “leave” from the current shot. If you are just banging the current ball into a pocket, you aren’t typically going to make your life easier on the next. The best players I play against have great touch. That means most of their shots are hit softly with low power. My personal goal on any typical shot is to try and hit with a speed that drives the object ball to have just enough momentum to gracefully fall into the pocket. In my head, I picture the pocket is not a hole, but continued flat table, and I try to hit with a momentum were the object ball would come to rest at the back of the pocket. Thus, the cue ball falls gracefully over the pocket edge into the pocket. That little extra momentum that would take it to the back of the pocket (if the hole wasn’t there) is just enough that I can still make the shot if I misjudge and hit the shot too soft. In the screen shot below, it doesn’t take much power to finesse the 13 ball into the corner pocket, keeping the cue ball from flying all over the table. The indicated strength to hit the shot is even a little hard for the current cue (5/10 power bars) and should be lessened a bit closer to the second line. Rarely do skilled players hit a shot over with 50% power. 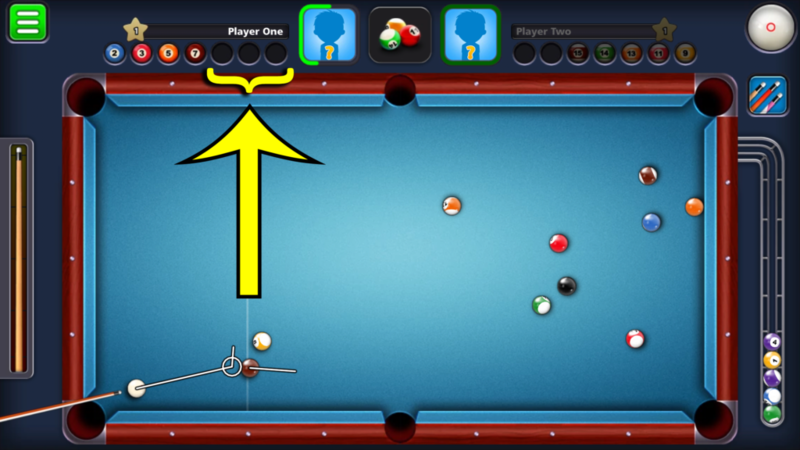 Take some time to and play an offline game and discover what the exact power is for your cue to hit the cue ball from one rail to the other on both the with and the length of the table. If hitting a long shot, you would rarely want to us a power that’s more than what it takes to get the cue to travel the length of the table. Once you’ve got touch down, then the door opens to working the cue ball around the table with each shot. This is where you’ll have your cue stick hit the cue ball in different locations (top, bottom, left, right, upper left, etc) to achieve various results after the cue ball makes contact with the object ball. This spin put on the cue ball by the tip of the cue stick when struck is called English. 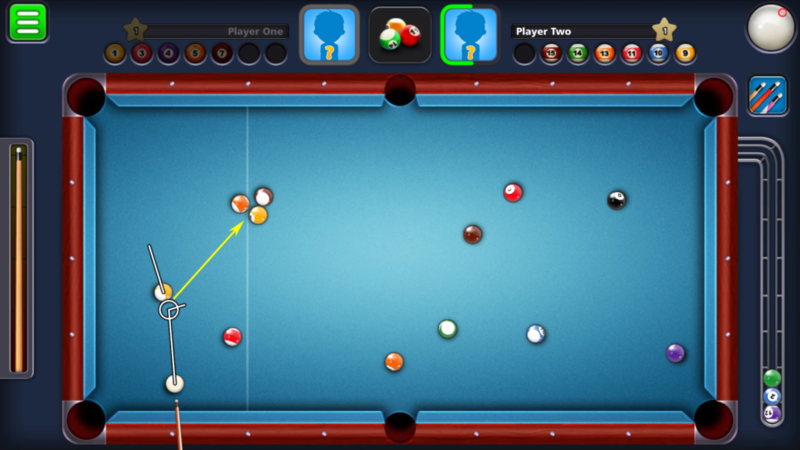 In the screen shot below, top spin English is used to change the trajectory that the cue ball will head after contacting the object ball. In this shot, the English is used minimize the chance of a scratch as well as get better position for the leave after making the 15 ball (striped maroon). 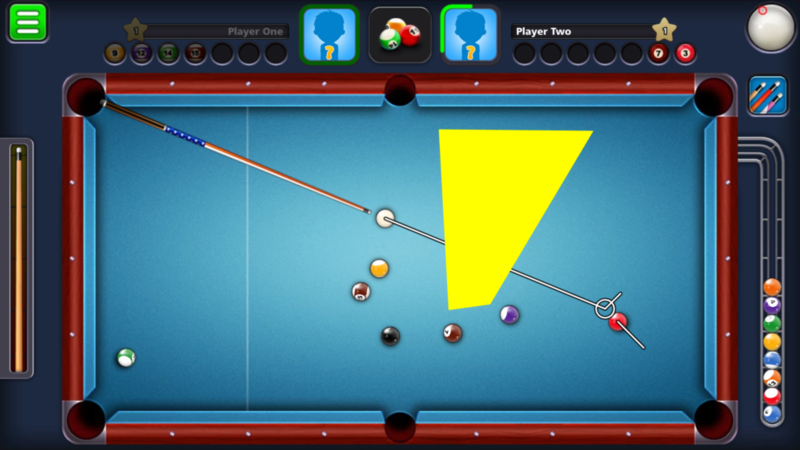 In the shot below, the leave needs to be in the yellow shaded area to result in a touch shot on the 7 ball who’s leave is an easy shot on the 8 ball. A soft shot with no English will actually head fairly parallel (as opposed to the 45 degree angle the guide shows) towards the rail after striking the object ball and come off flat towards the bottom of the yellow area. You have to have to be really accurate with your speed as the width of that yellow area is not very big. You could easily be short or long, making the finish of this game difficult. But putting left spin or top left spin on the cue will cause the cue ball to spin off the rail and head towards the top of the yellow area. This area is bigger and wider allowing you to be less accurate with your speed and still have the same shot on the 7 ball. In the shot below a soft touch should suffice to keep the cue ball from headed up to the center pocket at the top of the screen shot. But a little top English will force the cue ball to surely head squarely into the two striped balls, killing any of its momentum. This little extra guarantee makes sure the cue won’t possibly skim off the side of the 9 ball (yellow stripe) and head into the top pocket for a scratch on the 8 ball loss. The shots above are just a few random examples of English shots. Personally I most often only start to use English towards the end of my run when things start to get difficult. It gets more difficult because I have less balls on the table and therefore less options. There will usually also be more of my opponents balls on the table potentially blocking some of my shots or leaves. Usually I can simply use a soft touch shot with good shot selection to work my run towards the 8 ball. If my opponent still has most of his/her balls left on the table as I get down towards the 8 ball, I’ll likely need to work some English to make sure I don’t get blocked by one of my opponents balls left on the table. It’s also good to spend some practice time learning how spin affects the cue ball’s angle off of one rail as well as two rails. Weird thing start to happen when the cue ball hits two rails right after hitting the object ball (usually in a corner area). I see a lot of players mess up the leave of the shot on the ball before the 8 ball, such that they leave themselves with no shot on the 8 ball. So they miss and I run the table on them. Most of your shots should be hit with a soft touch. Rarely should you hit a ball hard. I win a lot of games against players that have the cue ball flying all over the table. Again this goes back to leaning to shoot with a soft touch. I see a lot of different things happening when the cue is hit hard. The cue often ends up hitting another ball, unintentionally putting that ball in a position that forces my opponent to recalculate the run or even blocks the next shot. The cue often ends up getting hidden in an awkward location behind another ball. And these hard-hitting players tend to scratch a lot… at the worst times. Often on the ball before the 8 ball, where they end up giving me ball in hand with the opportunity to run out the table. Realize, the more the cue moves around the table after hitting the object ball, the more likely it is to scratch. One of the biggest lessens I learned from the old guys that used to come down to my college rec center was to play defense. When you don’t have a high probability of making the current shot, learn to give up your turn in a way that makes it highly likely that your opponent will be forced to give control back to you. Learn to find places to hide the cue ball such that your opponent will either have a very difficult shot or no shot at all. Even better is to find a place to hide the cue ball such that your opponent can’t even get at one of their own balls and therefore ends up giving the ball back to you with ball in hand. In the screen shot below, the stripes player, not having a good shot, took a defensive shot that left the cue ball in a defensive position such that the solid ball player doesn’t have an easy shot to make on a solid ball. The solids player does have just enough opening to get at the 7 ball (solid maroon), but the chances of making the shot are slim. If the leave was a little better by the stripes player such that the cue was tucked up closer to the 15 ball (striped maroon), there’d be a good chance that the solids player wouldn’t be able to hit his own ball first, which would result in a scratch, and would thus give control back to the stripes player with coveted ball-in-hand. Before I really realized what those old guys were doing to me at the rec center, I would get so frustrated that I was having such bad games. I was missing so many shots and blaming myself, but really they were making sure they didn’t leave me with an easy shot. These guys were good enough that they would take shots that they knew would not only be a good leave for themselves, but would be a difficult leave for me if they missed. In the digital world I’ve had players do lots of things that would get you banned in the real world (or beat up in a bar), but they are good defensive maneuvers. I recently had a player who didn’t have a shot. I watched his aim turn and he directly made one of my balls. The table was set up such that even with ball in hand I couldn’t get a good shot on what was now my last ball. If I still had the other ball on the table, I could have set up a shot on that ball where, as part of the leave, the cue ball would come off and break up the blockage issue on the last ball. But because my opponent sunk that ball, I didn’t have that opportunity. This was a good defensive move, but in the real world its bad social play. You’ll win the game, but nobody’s going to continue to play with you if you do things like that (at least from my experience 15 years ago). I’ve had other opponents use the cue ball to hit one of my balls into a difficult situation (not hitting his own ball first), such that even though I got ball in hand, I still didn’t have a shot. This again would be something that’s not socially acceptable in a pool hall. Socially acceptable is to always try to hit your own ball first. I’ve have had players respectably push one of their balls next to one of my balls or next to the 8 ball such that I wouldn’t have an easy shot on that ball during my turn. That’s socially acceptable defense. The player hit his own ball first and hit a rail after, making it a legal shot. Even if the player didn’t hit a rail after and I got ball in hand, its still fairly socially acceptable. Other times, if the angle is such that my opponent doesn’t quite have an angle to make a ball, the opponent will push their ball in front of the pocket that is most likely where I’ll need to hit either the 8 ball or one of my balls within a run. That’s socially acceptable defense as well. But alas this is the online world and since the 8 Ball Pool game doesn’t have full chat capabilities there’s no social pressure to play any certain way. Just win games however possible. Admittedly I’ve used a few “dirty tactics” to win a few games. I should beat myself up. The main take-away is to know that if you do ever transition to a real world game on a real pool table, some tactics that are done in this online game will be considered dirty and you could really make yourself look like a tool. ABC – Always be calculating! While my opponent is taking his turn, I don’t relax and take down time. I am continually looking at my own situation and trying to find the best run so I can execute once the ball is turned over to me. I ask myself, if my opponent misses this shot, where is the cue likely to end up. Then I’ll try to play out my run in my head picturing where I want to leave the cue for the next shot after each consecutive shot. This is a difficult skill, but the more you do it, the better you’ll get to the point where it becomes instinctive. You’ll get a lot of practice if you do it for each shot your opponent takes. Especially in a timed game, mapping out my shots before my turn gives me an advantage because I’m ready to start shooting as soon as my turn comes. Most times, because I’m not perfect in execution, I don’t get to play out the run as I had mentally pictured it. However, often times I am able to play out a portion of that run. In the 8 Ball Pool app, the game gives you less and less time with each consecutive shot, and having been prepared has saved me multiple times. What Would I Do With Ball in Hand? Along with continually calculating my own run while my opponent is playing, I am also constantly asking myself, what would I do if my opponent scratches and I’ve suddenly got ball in hand. This happens to me a lot, where I unexpectedly get ball in hand and I can immediately take action to free up a ball or two that may be in bad position. When I get lazy and don’t do this, I’ll usually use all my time trying to find the right shot before being forced to hastily make the shot and I don’t end up with a good leave. Rarely do I ever take the easiest shot with ball in hand. Of course, I won’t take an extremely hard shot. With ball in hand, not only can I often find a shot that’s very probable to make, but I can simultaneously give myself the opportunity to free up balls that are locked up in bad situations while further yet leaving myself in good position for the next shot(s). So ball in hand is a huge tool to take control of the game. Its not just an opportunity to easily make one shot. You should be solving multiple problems with ball in hand. 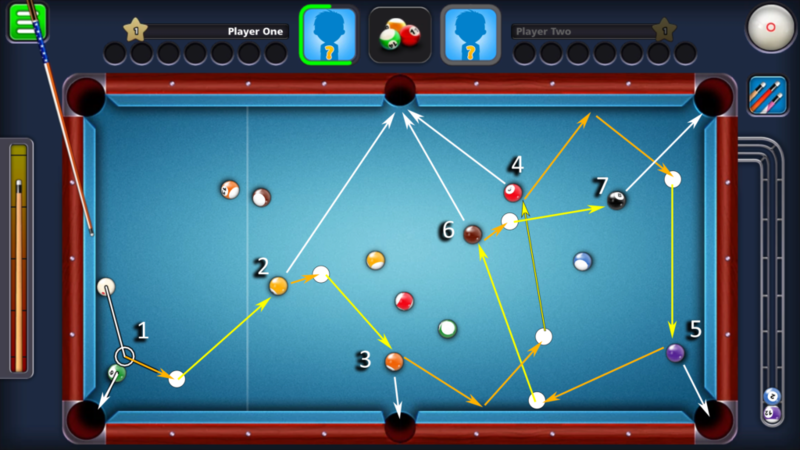 In the screen shot below, ball-in-hand is used to set up a shot where, using a bit of English (top right spin), the cue ball will come off of the 9 ball (yellow stripe) and break free the 15 (maroon stripe) and 13 (orange stripe) balls, which are a bit locked up and don’t readily have open paths to pockets. This happened most often to me when I was playing against players ranked under 40. I’d screw up a shot leaving my opponent with one or two balls before the 8 ball. In my frustration I would want to quit, thinking I’ve lost. But I forced myself to stick around just to see what would happen. Early on, against low ranked players, I’d say my opponent would screw up on their shot and give the game back to me about 30% of the time. It was unreal. As my skill level has increased and the game algorithmically matches me against better players, I still get a second chances to win at times, but it is much more rare at around maybe 5% of the time. Play some “offline” practice games and work on your draw. Know how hard you have to hit the ball to get a good draw for a given distance. This is where the game does a pretty good job of emulating reality. If you have a long shot (between the cue ball and the object ball) and you put draw (bottom spin) on the cue ball, you have to hit the shot pretty hard to actually get any draw. If you hit the shot softly, the friction of the ball going across the table will kill the backspin before before it hits the object ball and you’ll end up following the object ball rather than getting the intended draw. I see a lot of the less skilled players often following the cue ball right in the pocket after the object ball on shots such as these. I don’t like to use draw on long shots unless there is no other option. Its hard to maintain control of the cue on long draw shots. I prefer to you use touch shots. I will sometimes use draw on a short shot, but I use it with caution. And I still always look for a touch shot first. Though I love to execute a good draw, I can usually find a better leave with a soft touch shot than having to draw the ball back. Play some offline practice games where you force yourself to bank every shot. It’s a great way to learn how hard to hit your bank shots. This is another area where the game does a good job of emulating reality. The harder you hit the shot, the less angle you get on the 2nd half of the shot after it hits the rail. 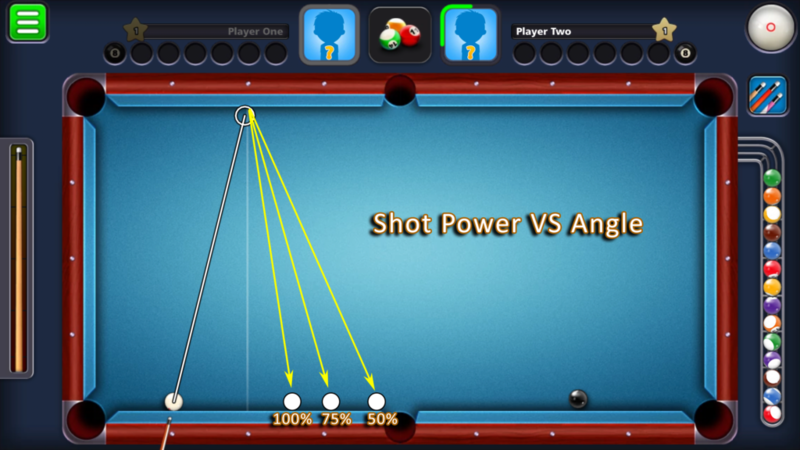 From my experience in the 8 Ball Pool app, a shot across the width of the table at 75% power comes off the rail with just a little over the angle with which it hit the rail. But I think this varies depending on the cue you are using based on how much power it has. The cue used below is a $40 country cue and has 5 power bars out of 10. It’s definitely something you need to play with and learn. 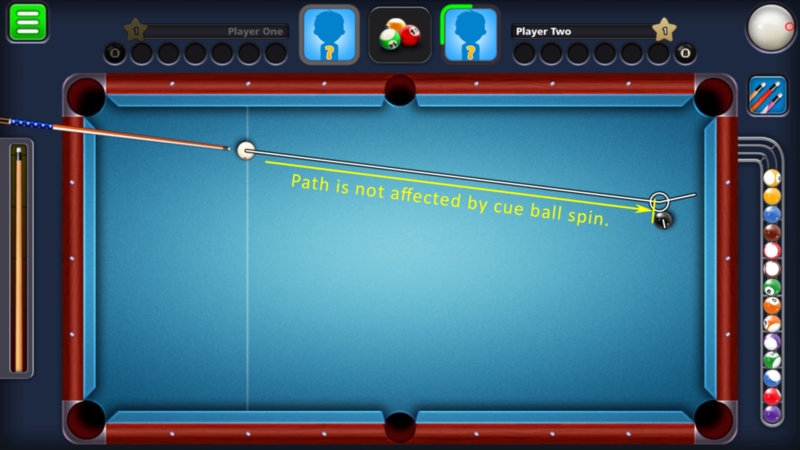 The screen shot below shows that the cue ball return angle off of a rail is dependent on how hard the shot is hit. The harder the cue ball is hit (and therefore the harder the cue ball hits the rail), the less angle the ball returns with. This may just be me, but multiple times I have gotten to what I thought was the end of a run with a perfect leave on the 8 ball, only to realize I had one more ball left. Therefore I force myself to continually know how many balls are in and how many are left on the table. The total should add to seven (not including the 8 ball). Or you can simply force yourself to get into the habit of looking at the remaining ball count shown next to your avatar before each shot. If you are like me, just doing this will save you a game or two out of every twenty or thirty games. That’s how often I make this mental mistake! Accidentally playing a 250k game when I was still playing $1k games. My strategy for when to move up a level to a harder, more expensive table. How I think the game chooses your opponent. 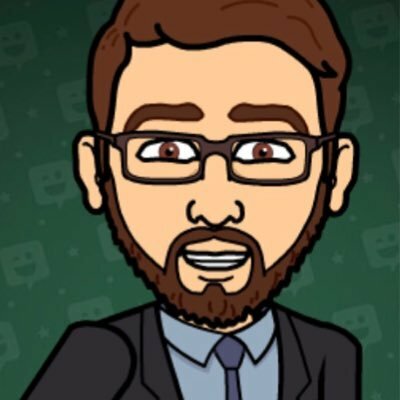 Player stat oddities: One guy had 600 million on 55 games?